New York is a vibrant city famous worldwide for its nightlife. Parties, DJs, clubs and lounges abound in this megalopolis that never sleeps. So, when the sun sets, it comes alive and brings forth dozens of ways to savor its night charms. From Broadway to comedy shows to live music to bar-hopping to ballet performances, visitors here can expect these all and much more. Broadway shows are the pulse of NYC and should not be missed. Buy a ticket and enjoy the best this city has to give. With the best of world theater available, ticket pricing should definitely take a back seat. You can also visit the TKTS ticket booth in Times Square for reduced price tickets for Broadway shows for same day performances. If big and glitzy shows are not your cup of tea, there are always off-Broadway and off-off Broadway shows to enjoy at lesser cost! Enjoy the visual delight that comes from a 360 degree view of glittering New York City at night. Nothing else can match the magic and radiance you experience here! The observation decks of the iconic Empire State Building are perhaps the best places in the city to see it glowing with a unique dazzle. Other places to get the same incredible views include The Top of the Rock and One World Trade Center Observatory. New York is best explored through a night walking tour. With camera in hand, you stroll around some of the iconic landmarks of the city, revelling in the glitter they emit and basking in the glow their beauty offers against the backdrop of the night. You can go on either a midtown Manhattan night tour or choose the 9/11 Memorial and Brooklyn Bridge tour. Dazzling strings of lights transform NYC completely as the sun sets. Go on a night bus tour and enjoy the Big Apple bathed in light and resplendent in multiple hues. On this double-decker hop on hop off New York guided tour, you can sit back, feel relaxed and get driven through the streets of the city taking in all the visual delights along the way. Amid lights and displays, you get to see world-famous attractions like Times Square, Rockefeller Center and much more. Nothing matches the magic and charm that comes from experiencing New York City at sundown. Cruise past the famous landmarks against the pulsating backdrop of lights illuminating the iconic skyline. Savor the vibrant visual display at night and admire top sites like One World Trade Center, the Statue of Liberty, Ellis Island, Governors Island, and the Brooklyn Bridge. Pulsating jazz clubs and late night sessions are the heartbeat of NYC. You can visit Harlem and take a peek into the history of jazz and other music. Enjoy the best of live music and performances and reach the city’s best subway musicians, buskers and performers. 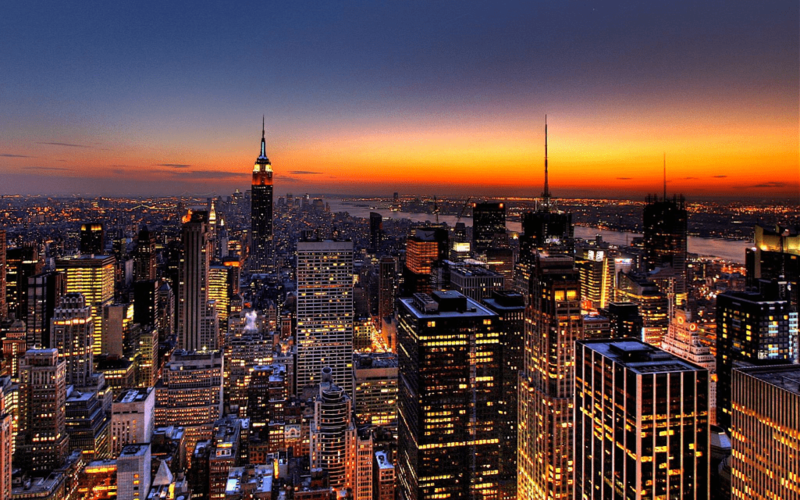 Visit the best of nightlife with hop on hop off New York tour and explore this megacity in the right way.